Keflavik Airport in Iceland has come a long way since I first passed through it twenty years ago. It’s certainly a lot bigger and grander than I had remembered, which is perhaps explained by the recent incredible increase in popularity of this tiny island nation for overseas visitors. Iceland is expecting 2.5 million visitors in 2018, which is an awful lot for a country whose entire population is about the same as Christchurch; and this appears to be fueled by an amazing number of flights – Reykjavik is now linked by direct flights to 98 cities in the USA and Europe. Wow! (and that’s the name of the local low lost airline as well). The vast majority of these visitors come in the peak summer months of June to August, when it’s warmer and the daylight hours are at their peak – this is the ‘land of the midnight sun’ after all! 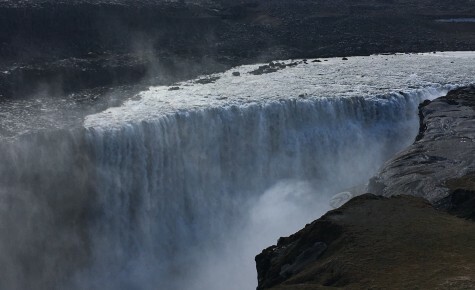 Most don’t venture very far past the very hip capital city and the famed ‘Golden Circle’ of the Southern highlands that includes Þingvellir National Park, the Gullfoss waterfall, and the geothermal area in Haukadalur, which contains geysers Geysir and Strokkur. 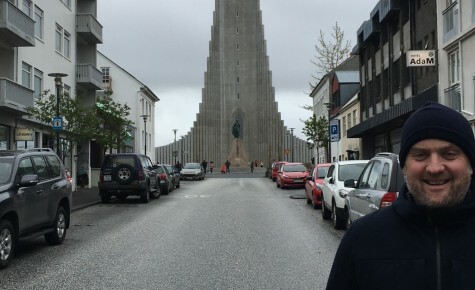 I’d highly recommend spending a couple of days in Reykjavik before or after a cruise to enjoy these iconic sights, and perhaps take a dip in the famous Blue Lagoon, but this time we would venturing much further afield! 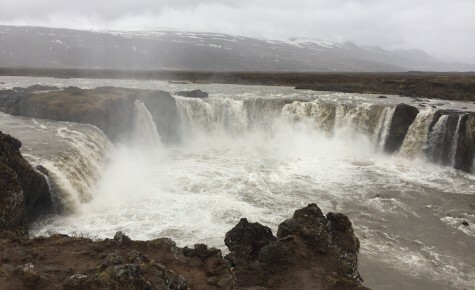 The popularity of Iceland is partly because of it’s starring role in so many recent movies and TV shows (who wants to go “North of the Wall” in Game of Thrones?) and it does a great job of doubling for other planets in sci-fi movies because of it’s incredible otherwordly scenery. Also because it’s just….different. 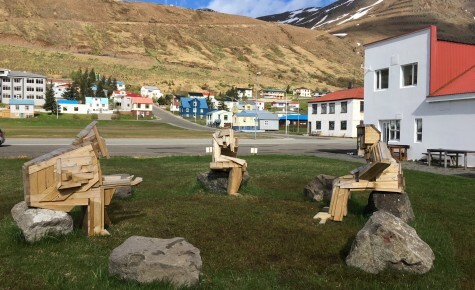 Centuries of isolation have clearly had an impact on the psyche of Icelanders, yes they are rugged and no-nonsense straight talkers with a wickedly dry sense of humour, but they are also extremely quirky. You just need to listen to it’s most famous pop star Bjork or the psychedelic warblings of the amazing band Sigor Ros to understand just how different they are. In 2015, activists protested against a new road plan in Iceland, as it would disturb the lives of elves who live inside the rocks in the path of the road. 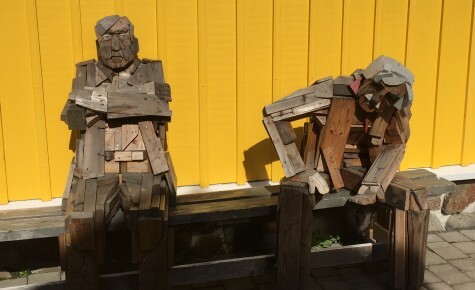 Construction works were stopped – the message was clear – don’t mess with the elves! 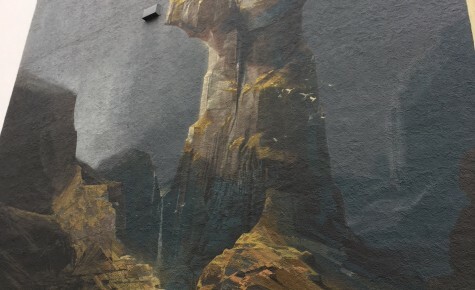 Icelandic folklore also strongly features troll-lore; we didn’t see any trolls on our travels, but heard plenty of children’s fairy-tales about them! Iceland has a reputation for being pricey – after the global financial crisis of 2008-11 it became a little more affordable for a short time, but it’s back to being one of the 5 most expensive destinations in the world now, and much of that boom has been propelled by tourism. Accommodation is at a premium – there simply aren’t enough hotels yet to keep the prices down, and like other expensive cities, short term airbnb rentals are running rampant. Eating and drinking out can feel expensive for those travelling with the NZ Dollar in their pockets, so when we were offered the chance to voyage aboard an expedition cruise ship that would be circumnavigating the island in 10 days – with all meals included, we jumped at the chance! 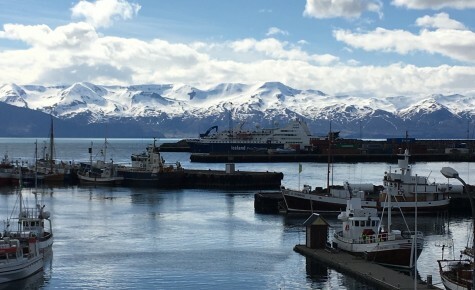 We sailed in late May, which is technically Springtime, although being this far North it would have been termed ‘winter’ anywhere else – we weren’t quite early enough for the springtime bloom, so the volcanic landscape was dramatically monochromatic, and we were a little too early in the season to see the large numbers of whales at Husavik which they enjoy in mid-summer, but by travelling in May we did avoid the summertime crowds.In the majority of the very small port towns we visited, we were the only tourist ship docked, and this gave us a real ‘locals’ experience, although there’s not much to ‘do’ in those ports, so the optional shore excursions by coach are really essential to see the nearby scenic highlights. Some of these were quite lengthy; anything from 3 hours to 9-10 hours.You should allow approximately USD$1000 per person for the optional shore excursions in addition to your cruise fare. 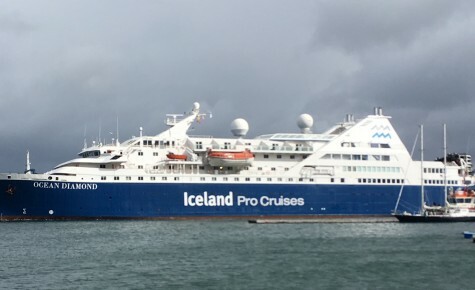 We voyaged aboard the 199 passenger Ocean Diamond with Iceland Pro Cruises. The ship is a venerable older lady now, holding fond memories for some guests aboard our voyage who remembered her previous incarnations as ‘Song of Flower’ and ‘Le Diamant’. The ship is extremely comfortable with well appointed cabins, cozy public areas and a fantastically cheerful staff. 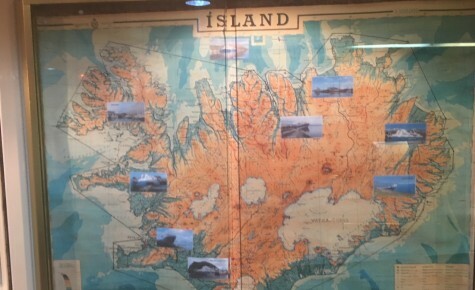 The expedition team included Sturlaugur, Hermann and Jens – a mixture of native Icelanders and Germans, and we voyaged with mostly American and German guests with a smattering of other nationalities. One of the unusual treats was having the vocal talents of Arndis on board, a well known Icelandic opera singer, who serenaded us in the evenings. 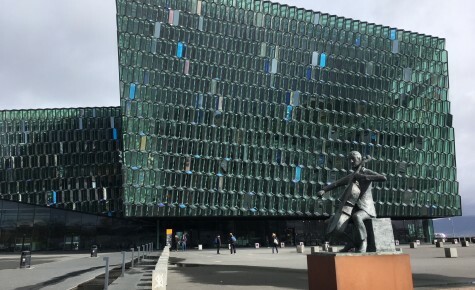 Port talks were excellent – informative and entertaining, covering topics such as Icelandic history and language and of course whale and bird watching. The food served in one sitting in the restaurant was excellent and plentiful (like all cruises!) and when you are off the ship touring during the day they provide a hearty packed lunch. The bar prices were very reasonable – much cheaper than ashore! 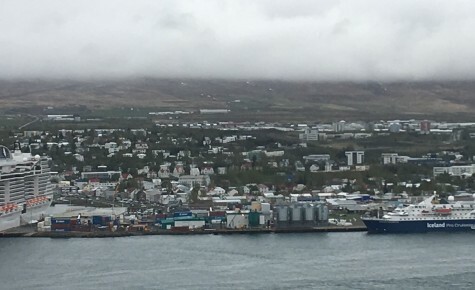 Our cruise would take us in around Iceland in an anti-clockwise direction, starting and finishing in the Old Harbour of Reykjavik. 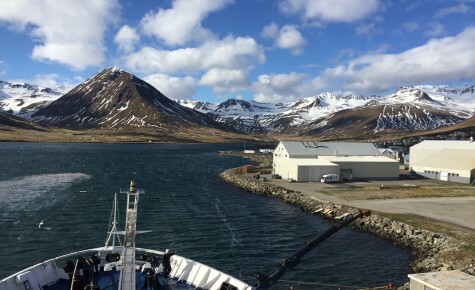 There were many scenic highlights on our voyage, one of which was our first stop at Stykkisholmur (we quickly gave up attempting to pronounce any of the placenames in Iceland!) 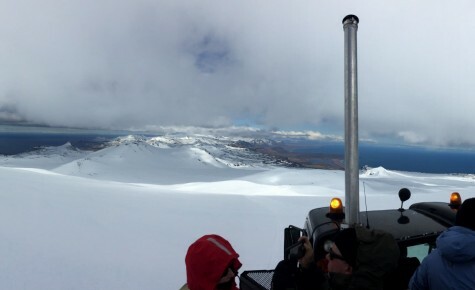 as this gave us the chance to visit the Snaefellsjokull glacier, which sits atop a 700,000-year-old dormant volcano that was featured in the Jules Verne novel Journey to the Center of the Earth. 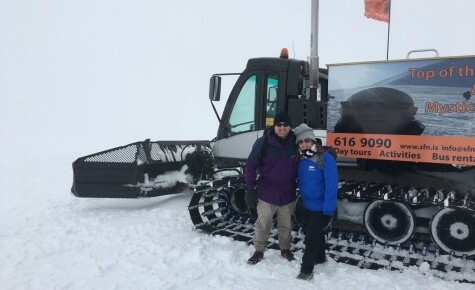 Our Snowcat driver – quite a character, took us on what proved to be a madcap ride up a very steep glacier to the summit, where we enjoyed incredible views over the Snaefellnes Peninsula. 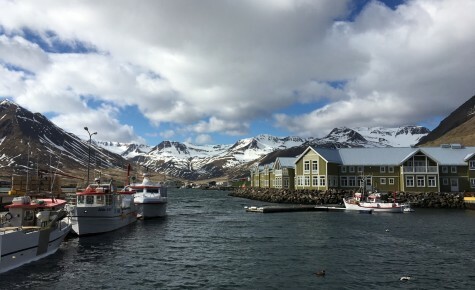 Isafjördur proved the benefit of travelling aboard an expedition cruise ship, as we got to experience the remote Westfjords region. 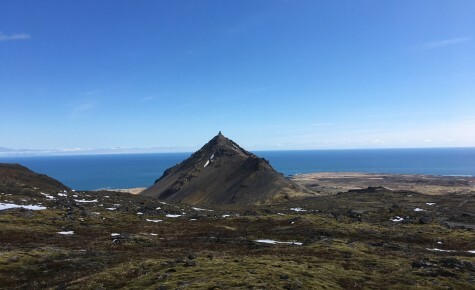 This secluded peninsula is connected to the Icelandic mainland by only a narrow strip of land and includes many roadless areas where cars have never been. The landscape is impressive – dramatic fjords carved by ancient glaciers, sheer table mountains that plunge into the sea and pristine North Atlantic vegetation. This was definitely one of the scenic highlights of the voyage. 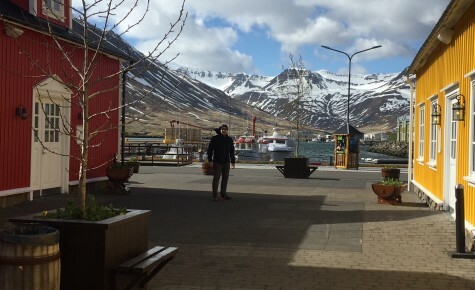 Siglufjordur, once the hub of the global herring industry is home to the unexpectedly impressive Herring Era Museum. Later that day we headed to uninhabited Grimsey Island, 40 km off the mainland and sits right on the Arctic Circle. We were all rather excited at the prospect of crossing the Circle – duly achieved (and a certificate presented to prove it!) and our zodiac ride ashore here was especially memorable as we saw hundreds of puffins in the water and then many guillemots and gulls on the island. 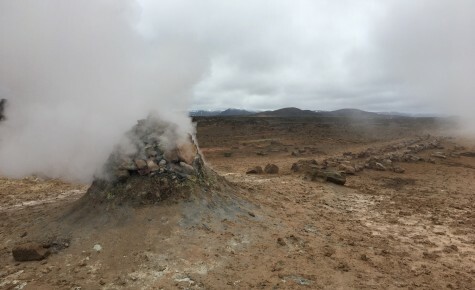 Akureyri and the fascinating Lake Myvatn region is famed for its rugged volcanic remnants.This area has hot springs, fumaroles and bubbling mud pools – it looks and smells a bit like the geothermal areas around Rotorua, but on a bigger scale. 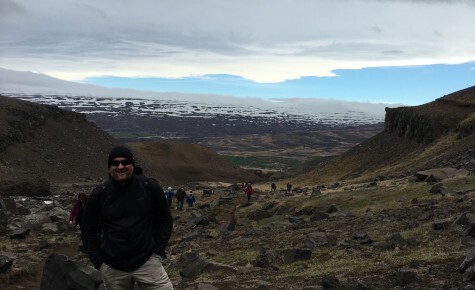 it’s also the access point to an incredibly fractured landscape – Iceland sits on the tectonic plate boundary between North America and Europe and you can see where the two plates have ruptured the earth above. We enjoyed a lovely soak in a large natural hot spring just before a dozen coach loads of mostly Italian cruise passengers arrived to attempt the same from the mega-ship MSC Meraviglia. 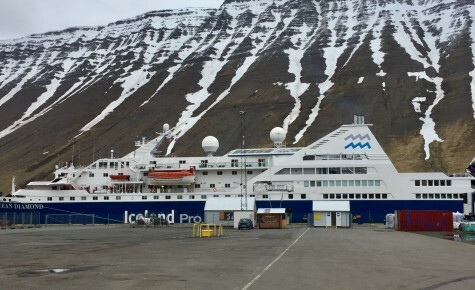 The Ocean Diamond was docked alongside this giant in Akureyri port – it was the only other cruise ship we saw in the entire ten days on the cruise and we certainly appreciated the benefits of small scale tourism by being on an expedition ship. 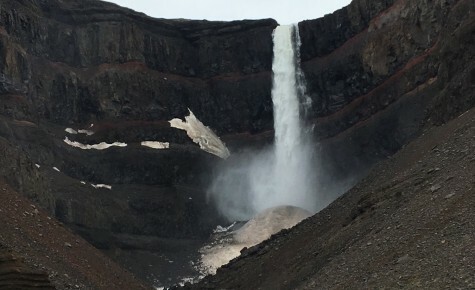 Seydisfjördur in the East Fjords is nestled between the sea and steep mountains and we enjoyed a day hiking among the stunning waterfalls here. 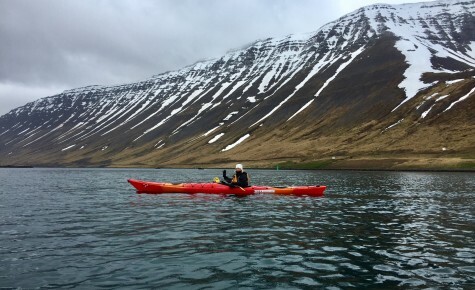 This is one of the great joys of expedition cruising – the opportunity to stretch your legs and get some exercise in the great outdoors – and there’s plenty of that in Iceland! Djupivogur is a fishing village in southeast Iceland, and the jumping off point for an optional excursion to the amazing glacier lagoon. 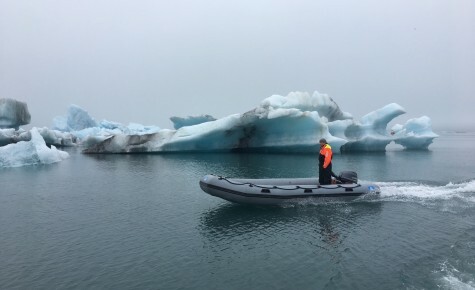 Huge blocks of ice constantly break off the glacier and large icebergs float on the lagoon, which is 250 meters deep! The bus excursion to the lagoon was long, but the opportunity to see the icebergs washed up on the beach and then to take a cruise on the lagoon among the huge bergs was too good to miss. Westman Islands are located off Iceland’s south coast, formed by submarine volcanic eruptions around 10,000 years ago. Surtsey Island emerged from the sea in 1963 and is one the youngest land masses on earth. Half-buried houses remain from a violent 1973 eruption. 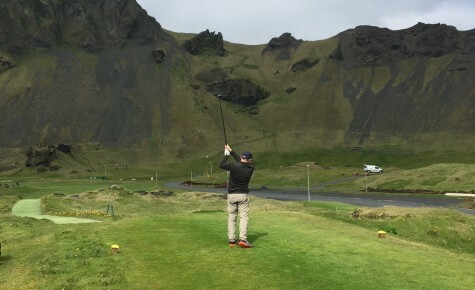 I played golf inside a volcano here – it would have to rank as one of the most picturesque golf courses in the world, and I’m using that as an excuse for my slightly haphazard performance! I’d recommend this voyage as an alternative to a self-drive itinerary or a coach tour of Iceland. The majority of your costs are upfront, so you can budget accordingly, and you’ll visit some remarkable, relatively isolated parts of this quirky, intriguing island away from the madding crowds. 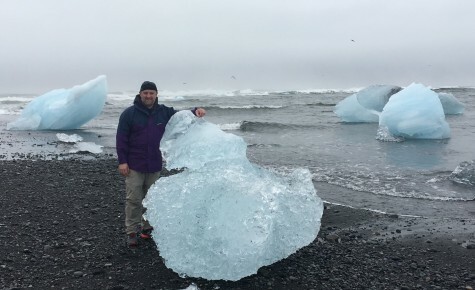 Iceland is utterly unique, and this is a great way to enjoy it!